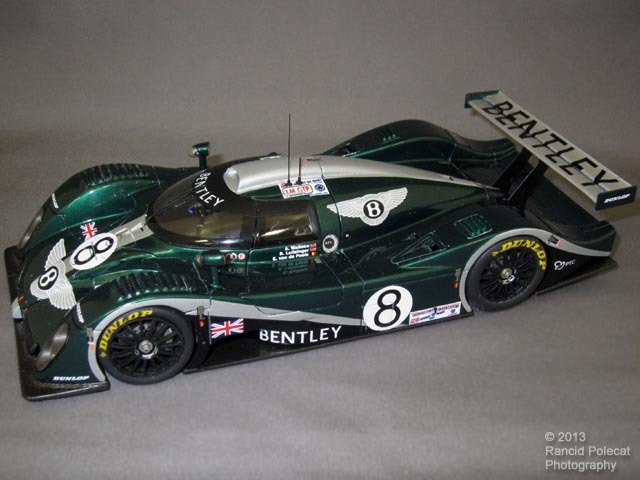 After a 73-year absence Bentley returned to racing in 2001 with a pair of "Speed 8" race cars, numbers 7 and 8. Strongly resembling and sharing some technology with the short-lived Audi R8C which had raced only once, the Bentley Speed 8 debuted in the 24 Hours of Le Mans (both Audi and Bently are owned by VW). That year the cars were fitted with turbocharged 3.6-liter Audi V-8 race engines developing in the neighborhood of 600 horse power. The Speed 8 reached a top speed of over 220 mph. The number 8 Bentley acheived 3rd place overall and first place in the LM GTP category for closed prototypes, with the number 7 car suffering a fire that took it out of the race.